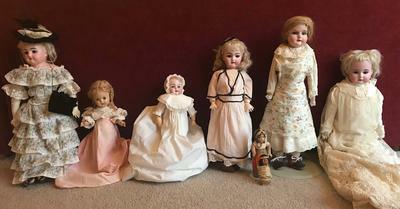 I'M 56 years old, and have dolls that belonged to my grandmother and her sister. From notes accompanying them, they date from 1895-1905. I was told that some of them have real human hair and sheep teeth. I no longer have the space to display them. Can anyone identify them and let me know if they have value; either monetary or historical? Is there any demand for such dolls? 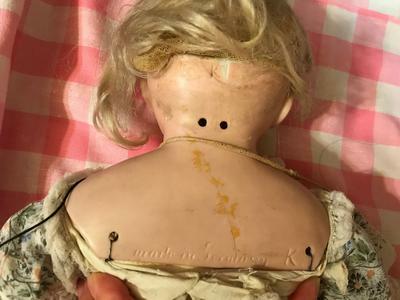 In addition to the markings in the 3 photos provided, One had a marking of "HANDWERCK". 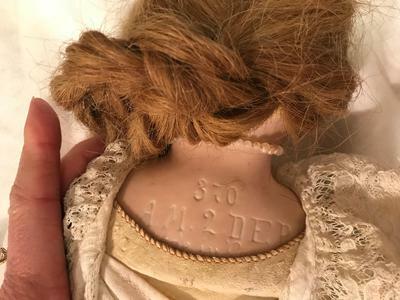 The small doll with braids has a circle, with a plus sign in it, on the back of the head, and the number 13 on her back. There's also a wardrobe of handmade clothing with them.